Will Nike Raise Its Dividend in 2017? The athletic shoe and apparel giant has seen its stock slump lately, but will its dividends follow suit or defy the downturn? Athletic shoe and apparel company Nike (NYSE:NKE) was the worst performer in the Dow Jones Industrials during 2016, and many investors remain worried about its ability to stand up to its rising competition and continue to post the outstanding growth that put the company where it is today. One area in which Nike could demonstrate its commitment to investors is with its dividends. Despite having a long streak of regular dividend increases, Nike's yield is subpar, and many income investors believe that the company could do far better. 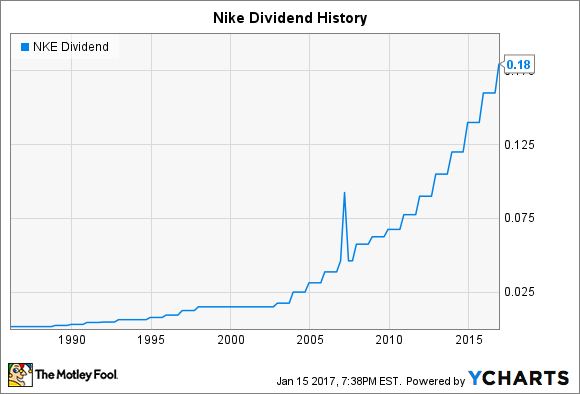 Let's look more closely at Nike to see what investors' prospects are for getting a dividend boost at some point during 2017. On paper, Nike has done a good job of demonstrating its willingness to boost dividend payouts to investors over time. With a 15 year streak of rising quarterly dividends, Nike has given investors expectations that they can anticipate higher payouts each and every year, regardless of how the underlying business does. Moreover, the recent increases have been pretty sizable. Late last year, Nike said it would boost its dividend by 12.5%. That followed increases of between 14% and 17% in each of the six previous years. At times, Nike's dividend growth rate has slowed, but you can see several periods over the past 15 years during which Nike made even larger increases on a percentage basis. NKE Dividend data by YCharts. Note: Spike corresponds to a 2007 stock split. Yet the thing about Nike's dividend is that it isn't all that impressive in comparison to its stock price. Throughout Nike's recent history, the stock's dividend yield has often been below 1%. It's largely because of the poor performance of the stock lately that Nike has managed to push itself above that key 1% yield mark. In other words, it's easy to make what look like big percentage increases to the dividend when it starts from such a low base. Because Nike has never been all that generous about paying dividends, the recent struggles that the business has gone through are of far greater concern to most shareholders. In 2016, Nike lost nearly a fifth of its value, and slowing sales growth and falling margin figures were the primary culprits for investor pessimism. In particular, the company saw slowing futures order sales, and despite Nike's recent success with direct-to-consumer sales channels, investors nevertheless worry about a possible switch of allegiance from some of its key retail partners. At the same time, difficulties in selling inventory forced Nike to offer more promotional discounts, and that weighed on margins, sending them to levels not seen in years. For longer-term investors, Nike still has plenty of promise. Despite sluggishness in the key North American market, sales in areas like Japan, China, and Western Europe grew at a faster pace, and the rising awareness of Nike as an international brand giant will be important once the rest of the global economy catches up to the strength that the U.S. economy has shown in recent years. Finally, one challenge to Nike's raising its dividend has to do with its massive stock repurchase program. The athletic giant authorized a $12 billion four-year buyback program in November 2015, and based on current prices, that buyback amounts to almost 15% of Nike's outstanding market capitalization. Having committed so much capital to buybacks, Nike doesn't necessarily have a lot left to use to pay dividends. It's still likely that Nike will give investors a dividend increase, with the most likely outcome being another $0.02 per share raise to bring the quarterly payment to an even $0.20 per share. Even if that happens, the resulting yield of 1.5% will still put Nike among the stingiest of members of the Dow Jones Industrials. Given average annual returns of more than 21% going back for 30 years, Nike investors are used to discounting dividends in favor of share-price appreciation, and most shareholders would much prefer a nice bounce to the stock price in 2017 even if dividend increases are minimal.